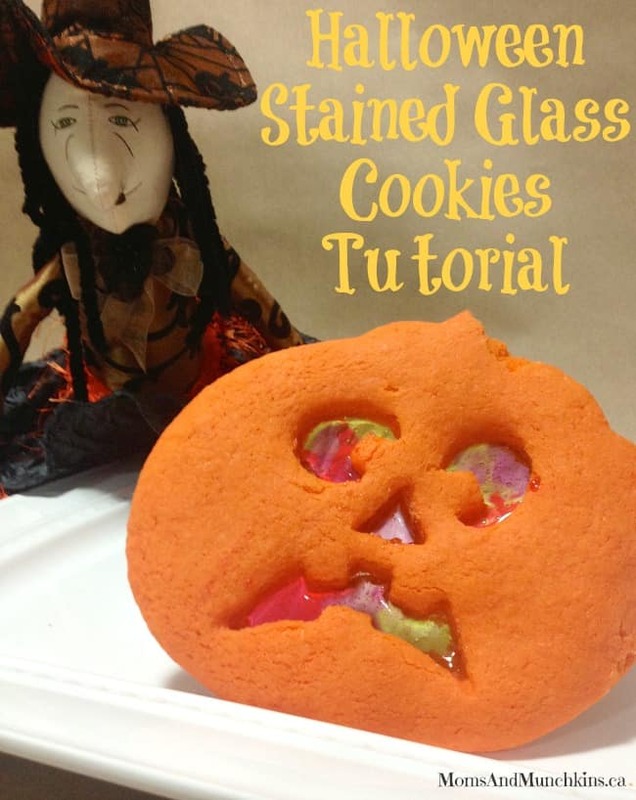 This post is courtesy of our contributor Leah…When looking for something unique and different for bake sales or for holiday sweets, stained glass cookies always stand out. 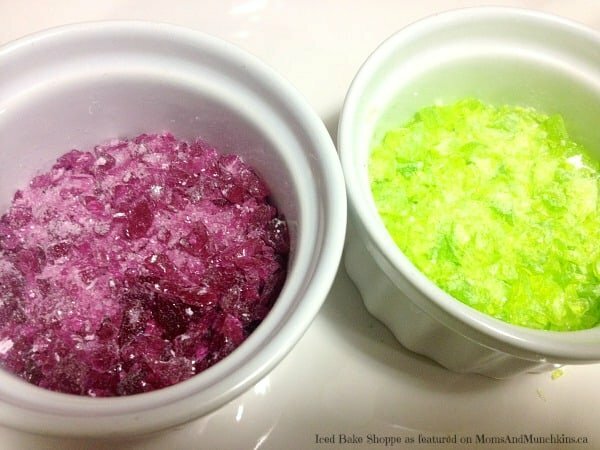 The addition of melted candy can quickly offset the need for frosting, and you can create one of a kind pieces just by mixing up the smashed candy colors. 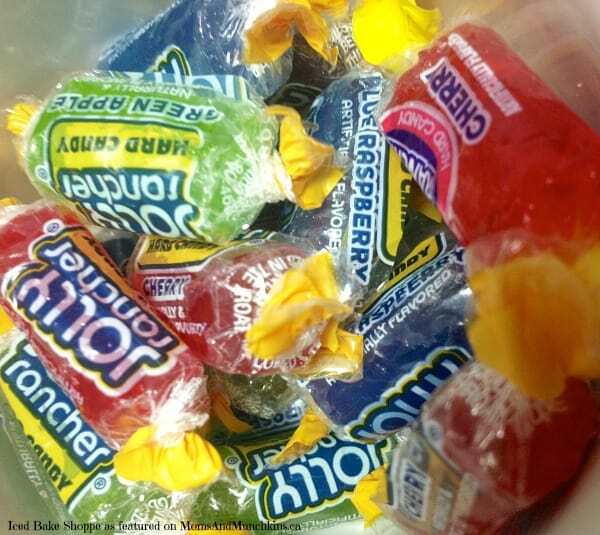 While in the professional kitchen, we often use boiled sugar (a risky endeavor) or Isomalt (an expensive sugar substitute), it is easy enough to do with candies that can be found in most grocery and specialty stores – Jolly Ranchers. Roll out the cookie dough to ~1/8” thick and cut out your cookies. Once the cookies are cut, cut out any middle pieces (eyes, nose, mouth). 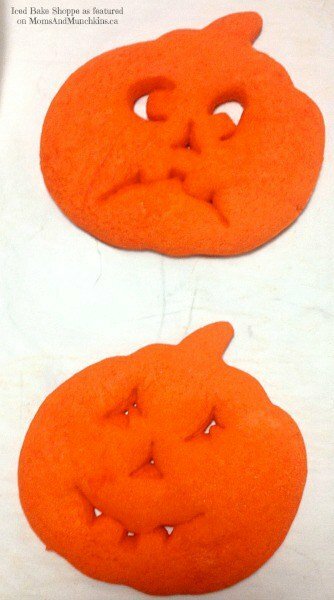 I colored my cookie dough with orange food coloring during the mixing process to give the pumpkins their autumn hue. Line a baking sheet with parchment paper (or a Slipat mat) and arrange cookies on them. Freeze cookies and preheat oven to 350F (or whatever temperature needed to bake your specific cookies). Once oven is heated, bake cookies for ~10 minutes (or until just starting to brown). Remove the cookies but leave the oven on. 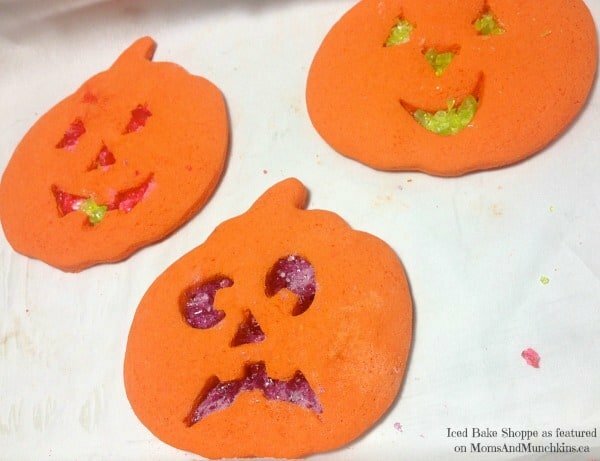 Once the cookies and pan are cool to the touch, fill the holes with crushed Jolly Rancher candy. 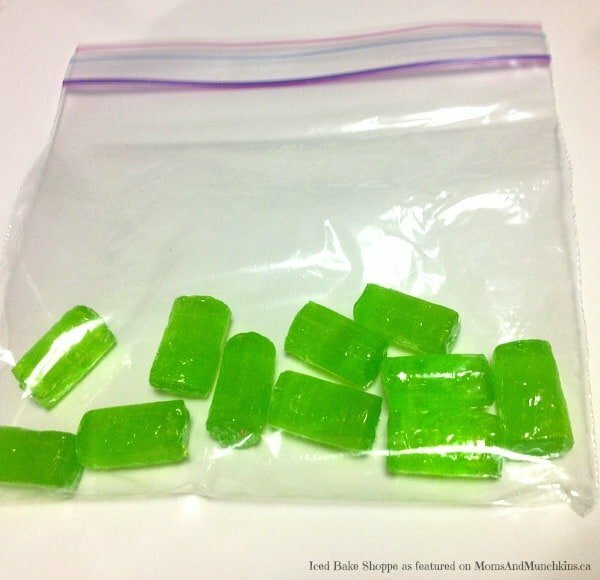 To crush, place individual colors in Ziploc bags and hit with a meat tenderizer until crushed. If you don’t have a meat tenderizer, grab a hammer. It’ll do the job just fine. Return the tray to the oven and watch for candy to melt. This generally takes 2-4 minutes. Do not permit candy to boil. Remove from the oven and let cool completely. Remove from pan. Enjoy. The most common problem I see and hear about is dough spreading and thus, losing the shape. This can be remedied before adding the candy. 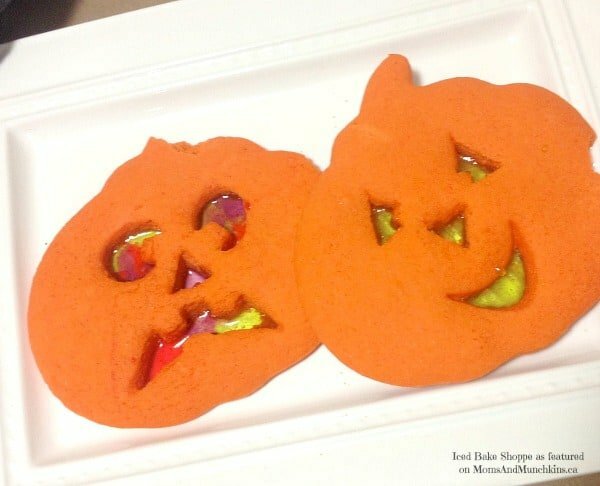 Once the cookies are cool – recut the holes with cookie cutters or a knife. I recommend when the cookies are cool as they are less likely to tear in the process. The cookies are sure to be a crowd pleaser and the technique can work for so many shapes, themes and events as well. The cookies can be further iced, although be wary as this can make them little sugar bombs. 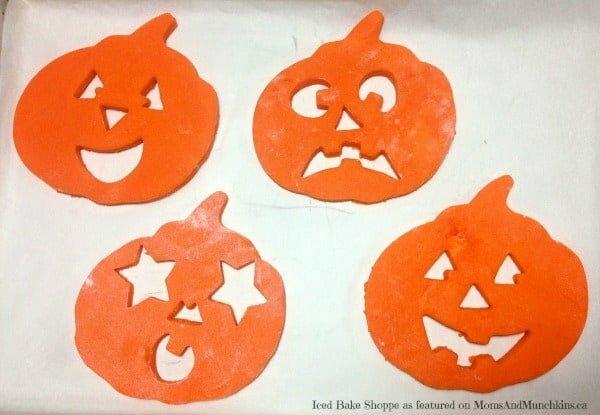 Other ideas can be cutting out the shape of ghosts and melting clear candy in them (make sure to pipe on a ghoulish face), or even just a plain shape with a spider web piped on. If you wish to hang them, once they come out of the oven use a straw to poke a hole in the top. This way, it’ll be easy to string some ribbon through. The cookies look extra haunted with twinkling tea lights behind them. If you have leftover crushed Jolly Rancher candies, as well as lollipop sticks – lay lollipop sticks on parchment paper and spoon the mixture over top. Place in oven until melted. Remove and let cool. This is a quick way to create (albeit flat) lollipops using the leftovers. Yes it may be a bit early to start thinking about Halloween (I guess not if you go by what the stores are selling). Halloween is one of my favorite holidays – especially in pastry and baked goods. It is the one time of year that you can really get away with some crazy color combinations, and break out the purple, black, orange and green. Next month we will walk you though another Halloween sweet that is sure to tickle the taste buds. Until then… happy baking (and sampling of course). Thank you to Leah for sharing this delicious tutorial with us! You’ll find more of Iced…Bake Shoppe’s creations on their Facebook page. They deliver throughout Canada and the US so you’ll want to keep them in mind for your next special celebration! Their cookies are always adorable & are the highlight of a party’s buffet table. For more tasty ideas, visit our Party Food and Family Meals page. We’re always adding new & delicious ideas so follow along on Facebook, Twitter, Pinterest, Google + and Bloglovin’ for the latest updates.